Not only is cucumber one of my favourite things of all time, but the scent is absolutely crisp, fresh and invigorating. I don't get a huge green tea vibe when taking a whiff of the pits, but I do think the two scents work well together. This product is ideal for working out, hanging out and even intense exam writing. The smooth cream applied from the solid bar is very lightweight and the scent is never overpowering or annoying. To put this review into context, it's important to note that I am a fairly moderate sweat-er. Nothing over the top, but it does occur every now and again. I don't experience even minor b.o. 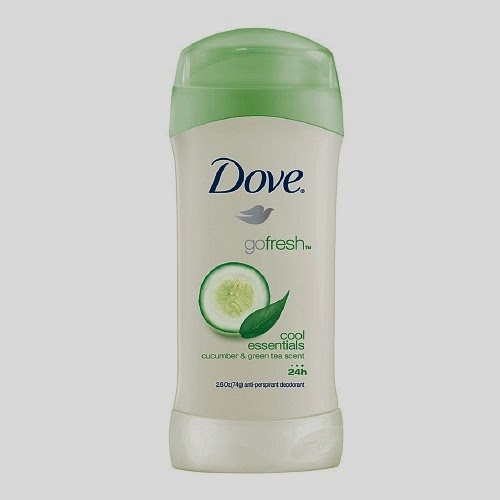 when wearing this deodorant, even after a 15 hour day or intense workout. The only scent left lingering is that addictive cucumberishtea freshness. After going through a few sticks of this deodorant about two years ago, I decided to try some other options. Back in January, I happened to receive a small trial-sized sample in the mail. Talk about re-falling in love! It's now completely used up and back on my shopping list. Although this product does include aluminum, silicone and alcohol, (the no-good ingredients which earthy people steer clear of) it also includes castor and sunflower oil which keep the skin moisturized and comfortable. Now I'm not saying that I wear this product every single day, but if I'm sensing a perspiration-heavy day, (sorry, it happens) this is the only stick I will reach for. Effective, deliciously scented and easy to use. Definitely an A product in my books.